The content is some thing like 散文。 Remember during my Pre-U life, read a lot of these types of books especially those written by the author - 三毛。Loves the way she described her environment and the way she lead her life. It's a pity that she committed sucide. But her books is definitely a good read. 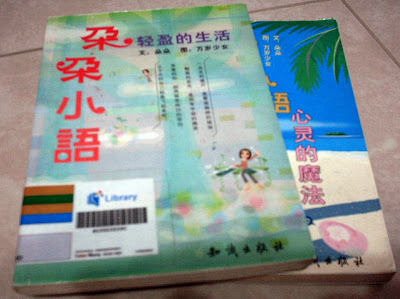 I'm currently reading the book entitled 心灵的魔法。Just a few pages, it really teaches you how to take life on the lighter side and how you can make yourself feel more relax. Shall continue. If i come across a page which i think is worth sharing, then i shall re-copy it here.